The Alf Williams interim bridge won the engineering excellence award for a project less than $5 million. Somerset Regional Council works manager, Andrew Johnson, said the Alf Williams interim bridge was the first of its kind in Australia to be used in flood recovery. "It was a fast, innovative project and it solved a major problem for the community," he said. "We needed a reliable solution that was likely to withstand future flooding, would carry traffic loads safely, would be environmentally sensitive to the Brisbane River and would be cost effective." 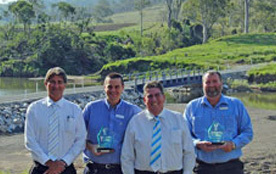 Somerset Regional Council Mayor, Graeme Lehmann, said the Alf Williams interim bridge was a highly innovative project and praised the engineering team for connecting the local community quickly in the aftermath of the January 2011 floods. "Our Council engineers have done a magnificent job and restoring this vital crossing is a testament to the ongoing hard work and ingenuity of our people in the wake of the most devastating floods in living memory," he said. "The community were the real winners as a result of this project but I'm very proud of our staff for winning these awards." "It was a team effort within Council and each and every person contributed to this achievement in some way," he said. The Alf Williams interim bridge project was completed quickly using a Unibridge structure. Project conception and planning was completed by March 2011 including removal of the old bridge destroyed during the January 2011 floods. Work commenced on site on April 4, 2011 and the bridge opened to traffic on May 10. The interim Unibridge can be reused as a temporary structure should the region ever endure a flood of similar magnitude and the bridge is now part of Council's Disaster Management Plan.